I drove an hour north to help a fellow fish lover with a goldfish problem. One of her fish had been floating upside down for several months. She had done everything she could find online to do and nothing was helping. When I got there I realized the poor fish had a large deep tissue tumor that was begining to show on the surface. Not much we can do for that sadly. I showed her how to euth with clove oil and helped her say goodbye. This wonderful lady also rehomed a beautiful catfish with me. So we brought him home and settled into quarentine. Wish I could have done more for the goldfish tho. Is that a high fin banded shark> that is such an interesting looking fish 👀? 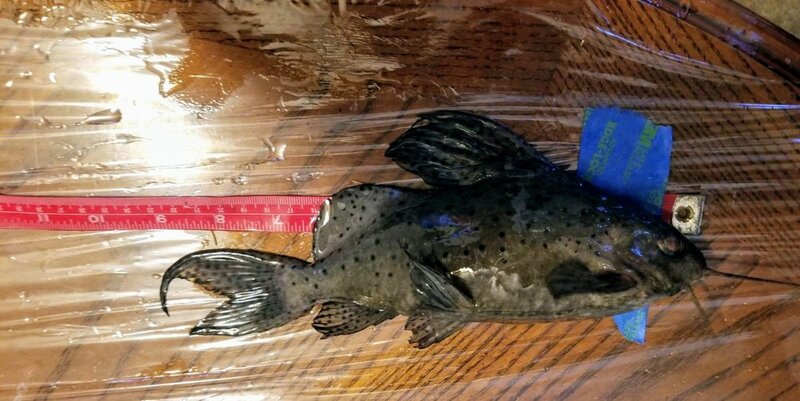 Synodontis eupterus. 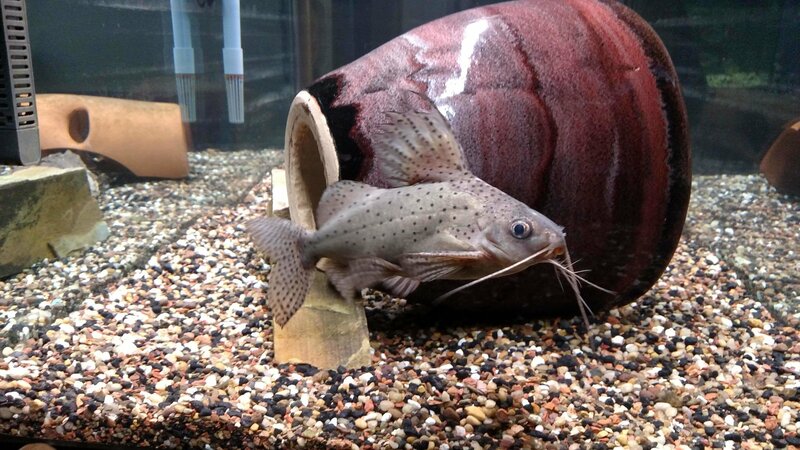 Common names are featherfin Cat or squeaker cat. This one is about 9.5 inches and probably female. (Females get bigger and have pot bellies and egg tube) its been a fun fish to watch so far. Petco had a sale on its less popular foods that were set to expire next month. 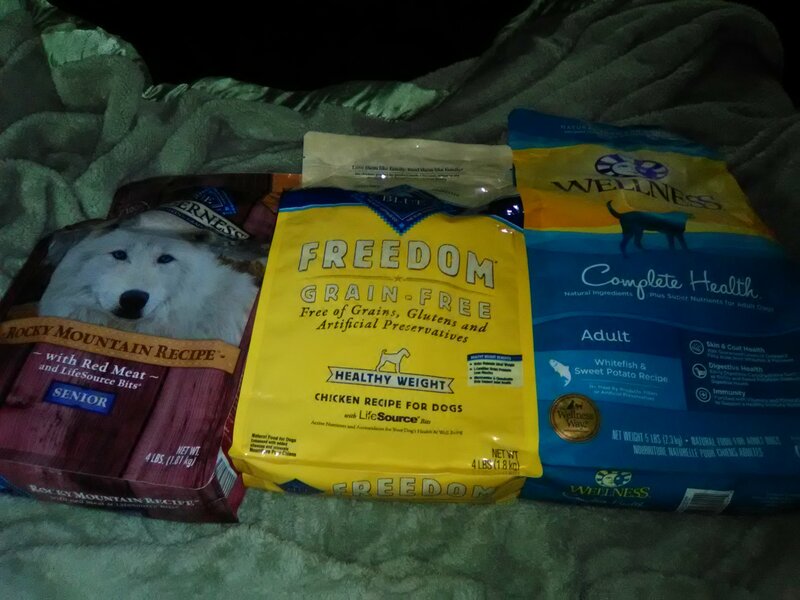 I got these 3 bags, 13 lbs of food for around $5. Pretty great deal when that bag of Blue Wilderness is usually around $26 by itself. My dog is 100 lbs so the food won't sit too long and so I'm not pressed about the nearing expiration dates on it. They're sealed bags and all is well. He's sort of a chubby man and so I don't suspect that he will have any issues as far as taste goes. I also decided to do a pH test on a bottle of water that we buy just out of curiosity, and the pH was 8.8 off the charts high... Same as my tap water. Very interesting indeed. Nice deal on the dog food! And I also found this Instinct cat food for $2 as well. It's the Kitten formula but I'm sure 20 year old blue doesn't care XD. She wishes she was a kitten again. Well she doesn't get good quality food usually. You see that giant bag of Special Kitty food that she usually eats. But our last two dogs lived to be 15+ years old and Blue there is about 20 years old. My other cat that ran away was over 10 years old. 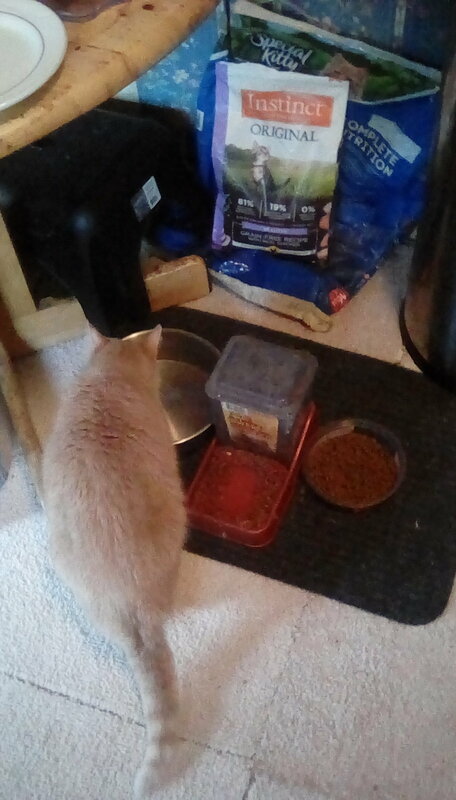 We've never really fed high quality foods because we really didn't know about it until we got my previous cat, because she had urinary issues and we had to search for different foods. Still, our pets have always seemed to do pretty well on standard foods thankfully. But I'm sure the higher quality food won't harm Blue and she's happy to have something different. Yea, we don't normally feed the high quality stuff either lol, I wouldn't be able to afford it. Just finished doing WCs. Did the main tank, bedroom tank and Cory tank. All messy buggers lol. Also topped up the ponds and moved some fish from tanks to outside. Just have the tropical tank left to do now. Last night it was 24° outside. I covered my mud pond. It'll be 28° tonight and its very windy. I left the cover on. I'll take it off tomorrow. Gave Mary and her minions another 25% water change. So she's had her 50% now. Everything looks good there. Her Barbies are getting so big. It's crazy. I've done some more research and it seems like the Barbies might get 3-4", which I had no idea because when I see Barbies in videos, they're always super dinky little fish. I hope mine don't get that big. Yikes. They're already little bastards. Its 27f here. Can we trade places!? Definitely! I cannot stand the heat! Man that is HOT, but you guys get mild winters so there's the exchange. Your goldies should be happy and growing lol. Mine are totally annoyed. Today was 62° as high. In two days it'll be 20° at night. Crazy. Its 3:30pm and its gotten to 115f so far today. Wow, I've been reading about the heat wave in Australia - try to stay cool! We had the heat issues in California, although not that hot... now that we've moved to Minnesota, we have temps going the other way; next Wed. it's supposed to drop to -32C (-27F) overnight with a high that day of -26C (-15F). So far today, I've done some laundry & walked the dogs, fed the fish & kids and am just poking around on the internet while watching the snow fall. We'll do a little run to the local grocery in a while, then I need to check over the kids' school work, and start them on today's lessons. My husband will shovel off the driveway later this afternoon, when the snow is supposed to stop for a while. As it turns out... The cats can't stand that food. Neither of them. I guess I see now why it was cheap. I would have been beyond furious if I bought that food at full price only for my cat to hate it. Today I did a clean of the mud pond. Kosmos, my favorite, is gone. All the other 6 were found doing okay. Some of them really are getting quite a bit chunky and I they were visible from the top. I did decide to net it finally properly... Was a pain but will definitely prevent any birds from hunting in there now. What a cutie pie... I want to find out what kind dude he is and see if I can care for him. He was looking quite pekid. Been mega busy lately with fish stuff and life in general. Removed a damaged eye for a friend's koi today then came home and did my tank maintenance. Ordered some aqaurium lights for a planted tank I'm setting up, meds for spring scheduled treatments, and fish food. Also picked up some more materials for the big tank build coming up. It was a long day, so glad its over. Its a pretty simple procedure. Took less than 3 minuets once the fish was sedated. I checked on him last night around 7pm and my friend said he was more active and seemed more comfortable than he had been in weeks. Wound sight looked pretty good, no unusual swelling or signs of infection. Hopefully in about 2 wks he can go back into his permanent enclosure. Its so hard to resist a good selection isn't it! Cool of the manager to give you some freebie tho. Well I did a very cold water change. Then added my plant basket to the tank. Then the stems of duckweed in there. 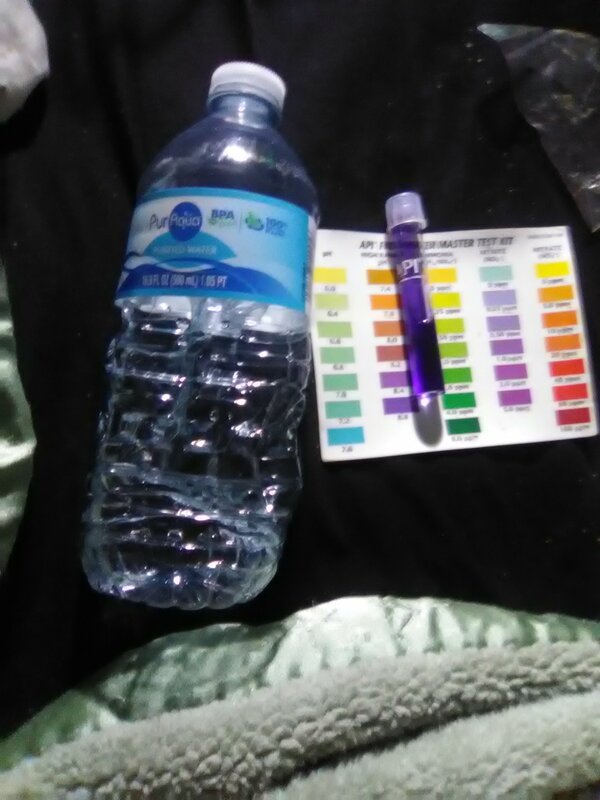 Lets hope this works.